World renowed painter Mr MF Hussain passed away yesterday morning in a London hospital. India has two reasons to mourn this death. For one, Hussain was a great talent and we were all proud of his art. Secondly, he died in a self imposed exile - away from his country and his people. It is sad that Hussain's art was often embroiled in controversies. 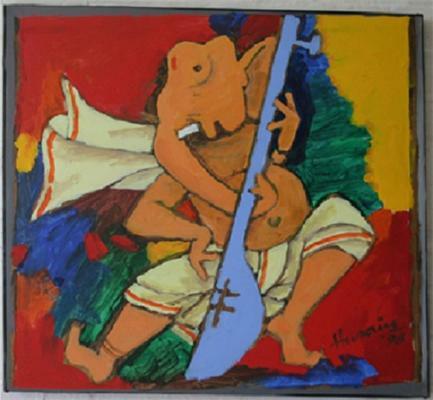 Though an artist should not be restricted in his creativity, Hussain's paintings often hurt the sentiments of Hindus. This led to a lot of litigation and hatred. Possibly his being a Muslim made things much worse in this regard. We are sorry that India has lost its Picasso. Here are a few of his famous paintings for you to enjoy. Bollywood Has Another Artist in Town! PK Motion Poster That's Landed Aamir in Controvery!